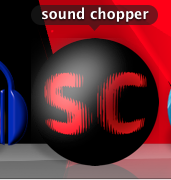 Sound chopper is a stand alone application built in Max/MSP that allows you to manipulate pre-recorded sound through is different sound effects such us pitch shifter, reverb, delay, looper etc… It’s useful for sound design and music, I mostly use it for sci-fi animations, robotics or glitchy sounds, stuttering etc... It's a very simple an intuitive tool. Inside the app you can find a short documentation that explains the features of this simple tool. Download it now for free (no need for max or max runtime), only available for Mac.